Happy Spring, everyone! 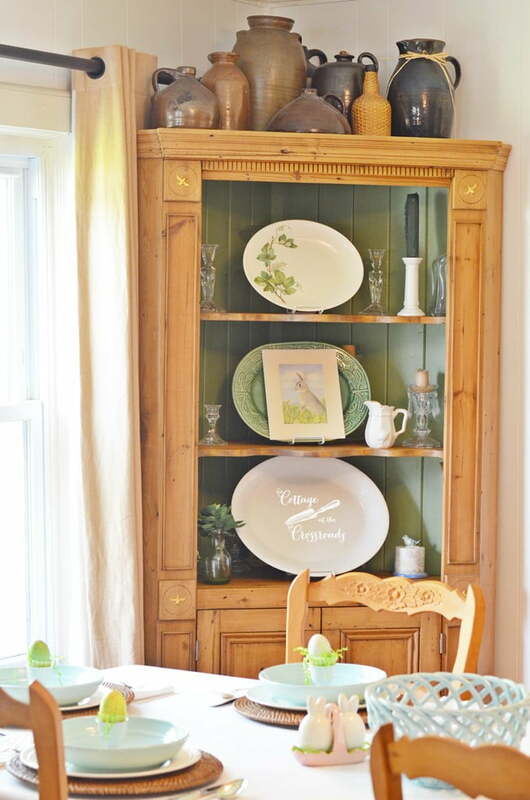 I thought I’d take you on a little spring tour of our country cottage today. Ah, spring is my favorite season. Is it yours, too? It is filled with new life, new growth, and contains promise and hope. What’s not to like about it except the pollen, of course! But I suppose even that’s necessary in the grand scheme of things, too. 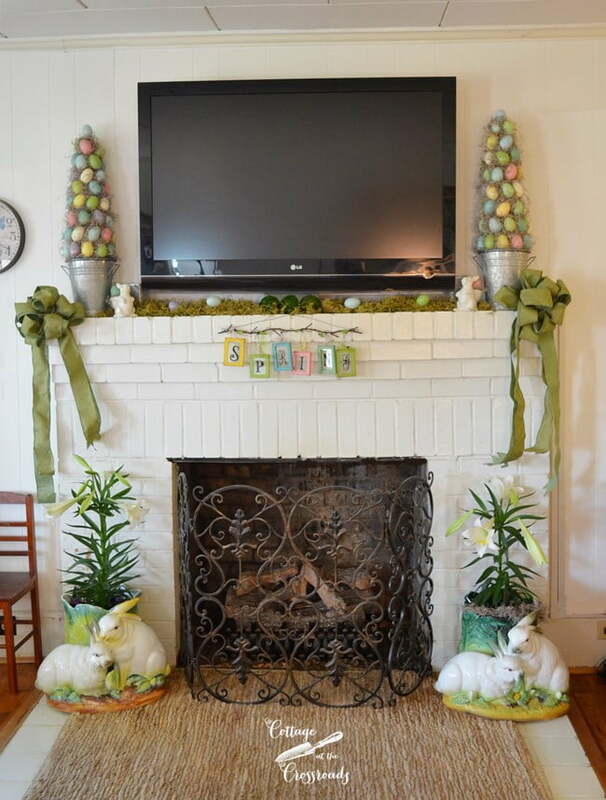 First up is our spring mantel featuring those egg topiaries that I made. I knew that I wanted something tall beside the TV so I created the topiaries for that purpose, and I’m delighted with how they turned out. 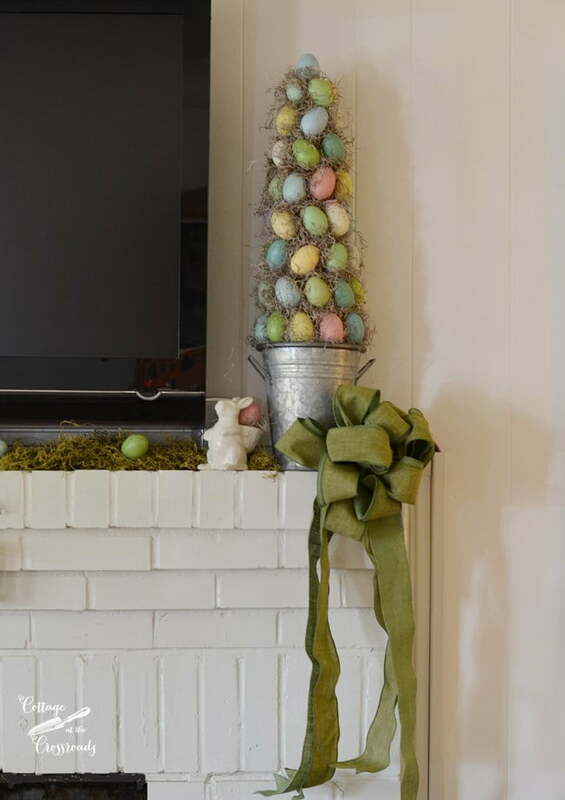 If you missed the tutorial on how I made them, you can read my post EASTER EGG TOPIARY. 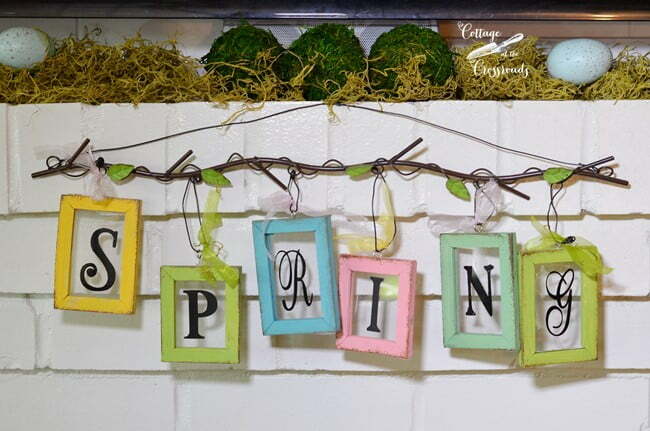 When choosing the colors of the eggs that I used in making the topiaries, I purposely selected ones that had the same colors to match this sign that says SPRING that I had purchased last year but never used. 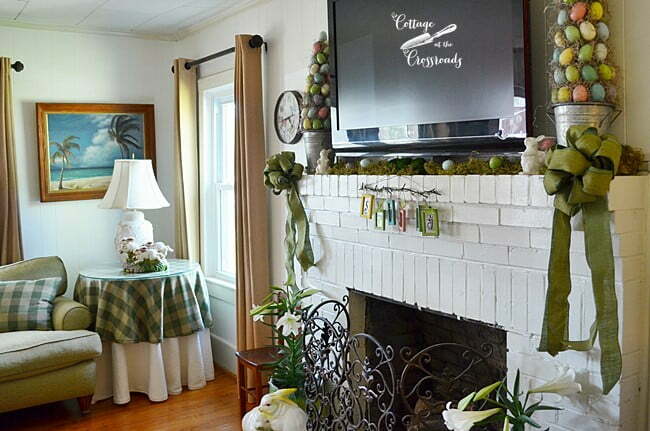 The large green bows were used on our Christmas mantel this past year. 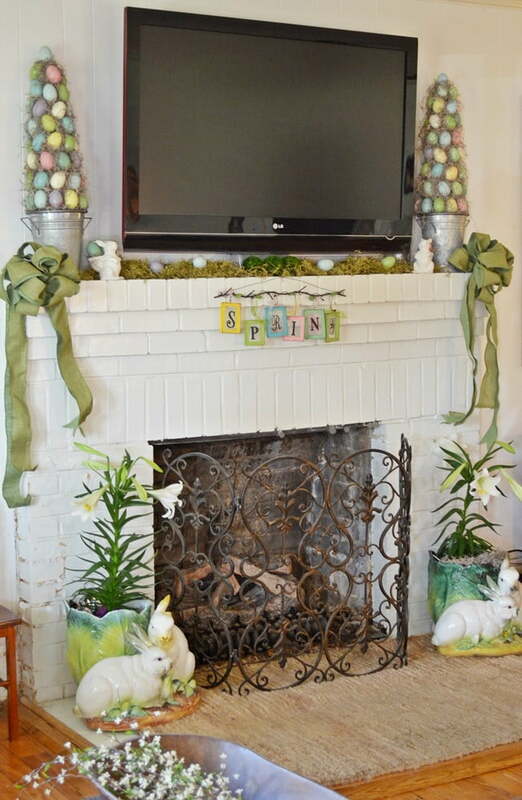 At the base of the fireplace, I placed 2 large bunny planters that I scored at the auction that we attend all the time. I found them about 3 years ago in the fall when no one was interested in bunnies, and I got both of them for about $35. At the time, I could not find any information about them online but just recently I found them HERE. You must click on over to that site to see what a deal I got on them! The 2 planters are slightly different but here you can see the sweet bunnies on one of them up close. 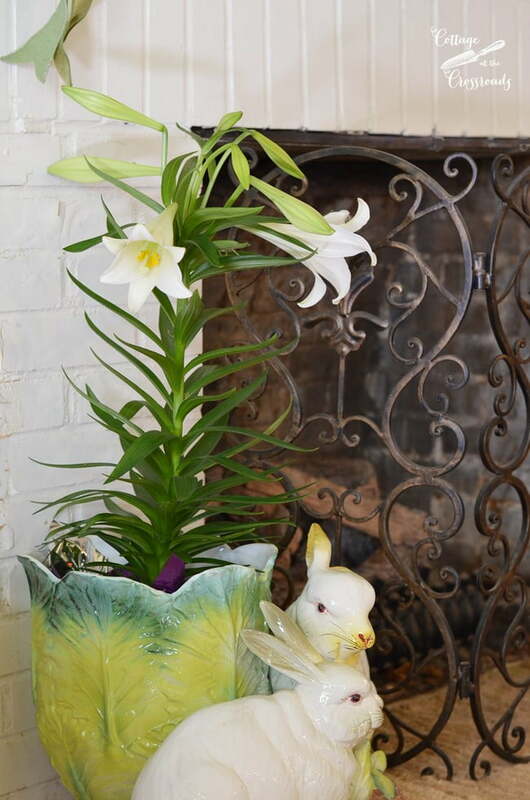 I decided to put the iconic flower of the Easter season in the planters. I will keep them inside until all danger of frost has passed, and then I will transplant them outdoors. Given the right conditions, the bulbs should awaken again next spring to be enjoyed again. 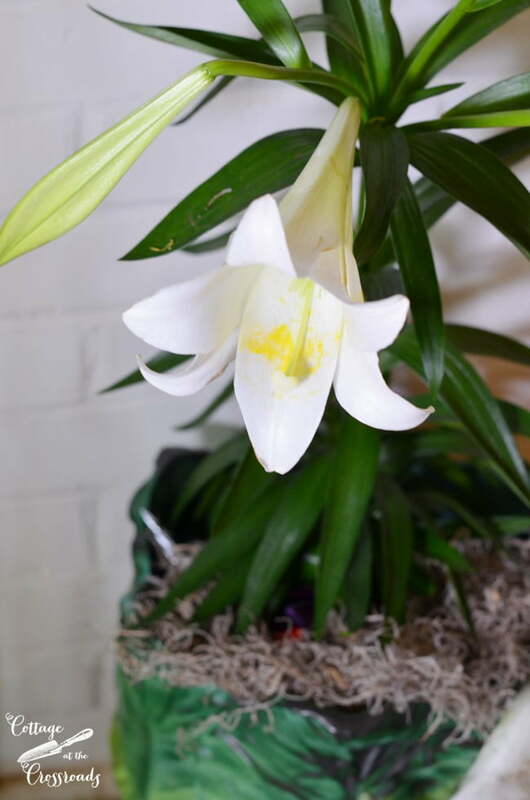 But did you know that Easter lilies are highly toxic to cats? Luckily, my little Henry has not been the least interested in the lilies. Beside the fireplace is a new clock. I ordered it from Amazon (affiliate link) when our other one fell and broke. The clock was very inexpensive, and I chose it to go with the artwork that is hanging on the other side of the mantel. 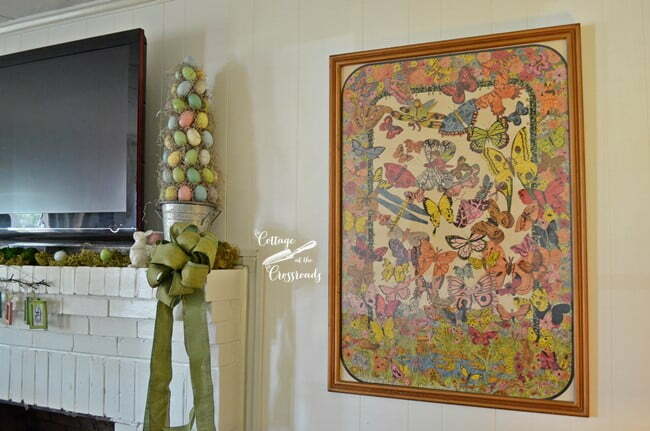 This piece looks like a tapestry from a distance, but it’s actually a pencil colored print that my late mother-in-law, Sarah Windham, did over 40 years ago when she was being treated for cancer. Amazingly, the colors in it have not faded with time. So glad that we have this family treasure. The fireplace screen we’ve had a long time, and I’m thinking about painting it white. What do you think, would you? I moved the dough bowl over to the coffee table, and filled it with a little spring. One day I really must tell you the story of how I acquired it. As you can see in this photo, I still have the green checked table skirt that I added at Christmas on the round table in the corner. More bunnies that I’ve had forever are on its top. 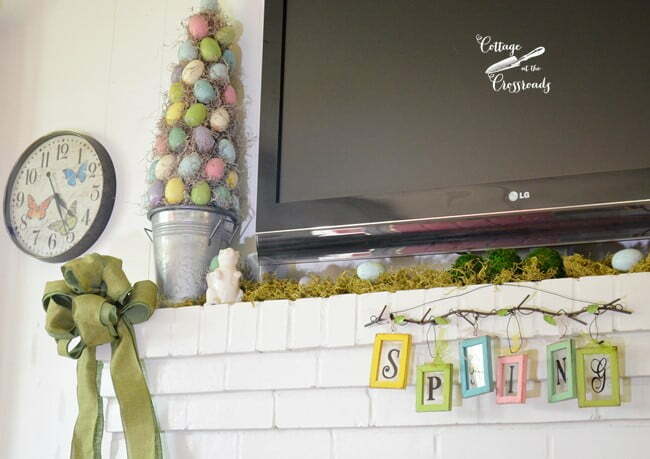 I hope you’ve enjoyed seeing our mantel all decorated for spring. But wait! There’s more! The dining room is all set for our Easter dinner. 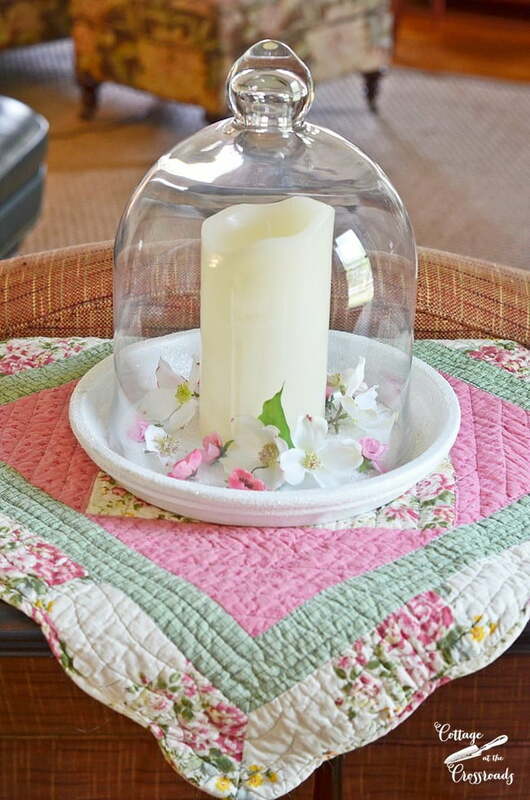 I used a white linen tablecloth with white napkins that have an little crocheted edge done in spring colors. 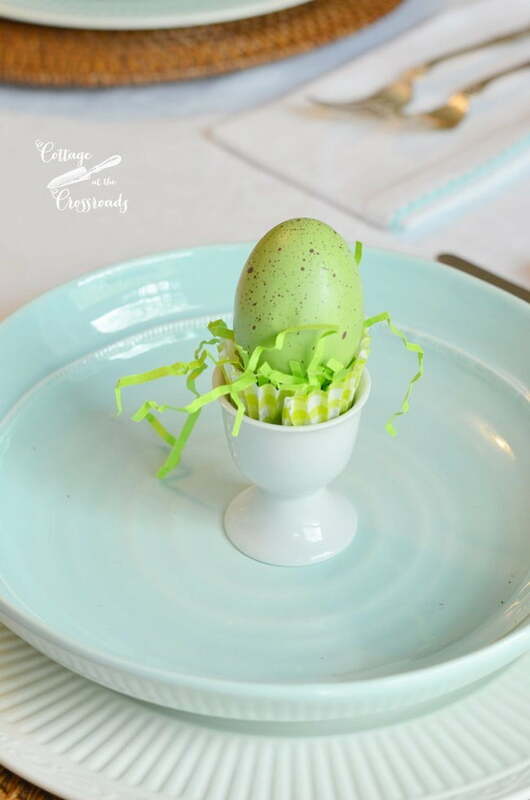 The egg cups got dressed for Easter by having a cupcake liner tucked down inside with some added excelsior and eggs. 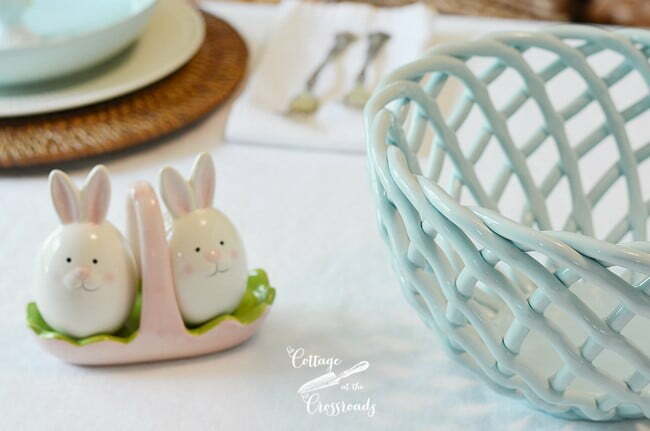 My little bunny salt and pepper shakers came out to sit with the new bread basket that you see. 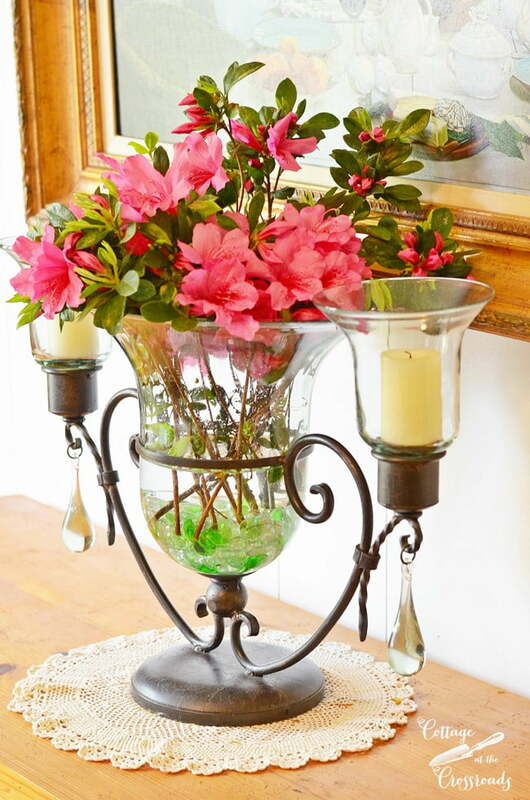 On the server is an arrangement of azaleas from our yard which helps celebrate the arrival of spring. 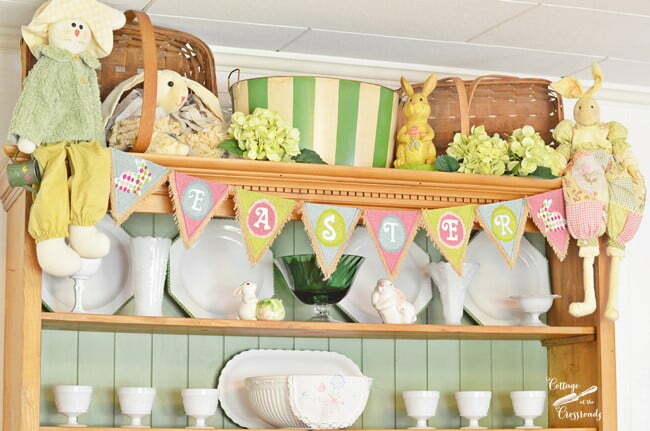 The cupboard has an array of bunnies on the top along with the Easter banner that I’ve previously used on the mantel. 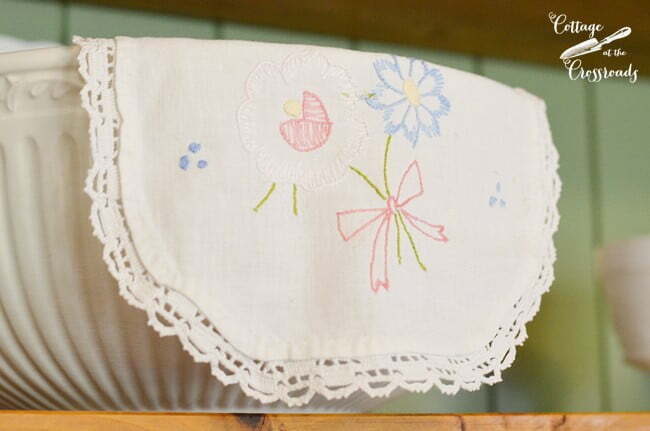 A bowl got a dash of pastel colors by hanging this little piece of embroidery work on its edge. And a few more bunnies are displayed on the shelves of the cupboard, too. I’ve already shown you my Easter tree in the kitchen, but in case you missed it, you can see it HERE. Thank you for taking the spring tour of our little country cottage. I’m wishing all of you a very happy Easter filled with the love of family and holiday traditions! Just gorgeous and so spring-y Jane! 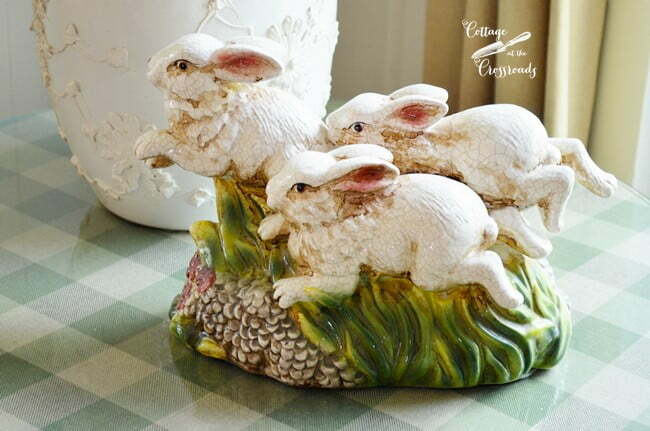 I had bunny planter envy BEFORE I saw they were Intrada, what a bargain you found! 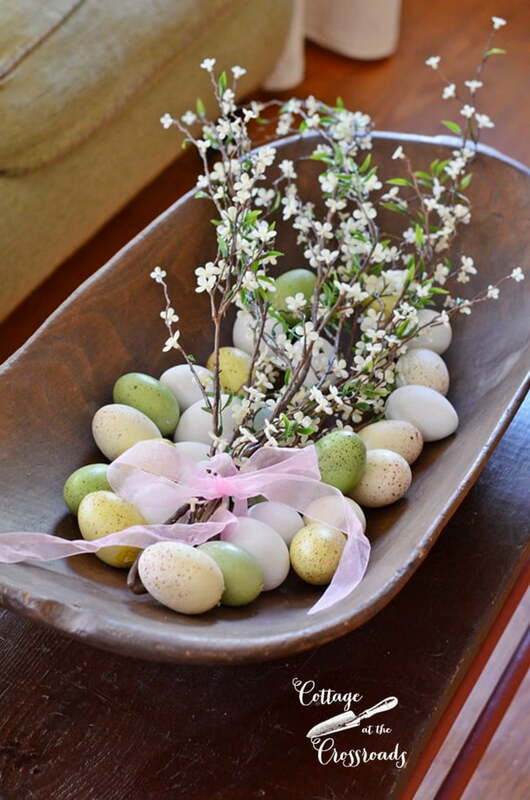 I love the sweet simplicity of your dough bowl with your blooming branches and Easter eggs! I really enjoyed your Easter Tour. Everything is beautiful! I love the fact that you used the bows and checkered tablecloth that you used at Christmas. Happy Easter Season! Yes, I would paint the fire screen white! It would look so beautiful white. 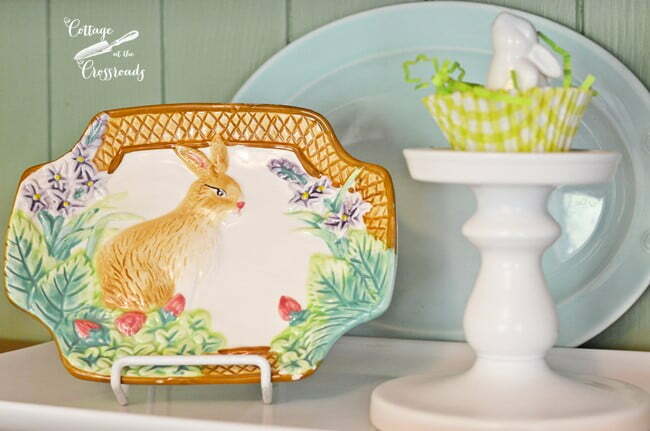 I can imagine entering your home and smiling from ear to ear!….So very beautiful and cheerful…the perfect touches of spring throughout your beautiful home Jane. I do love the topiaries …. 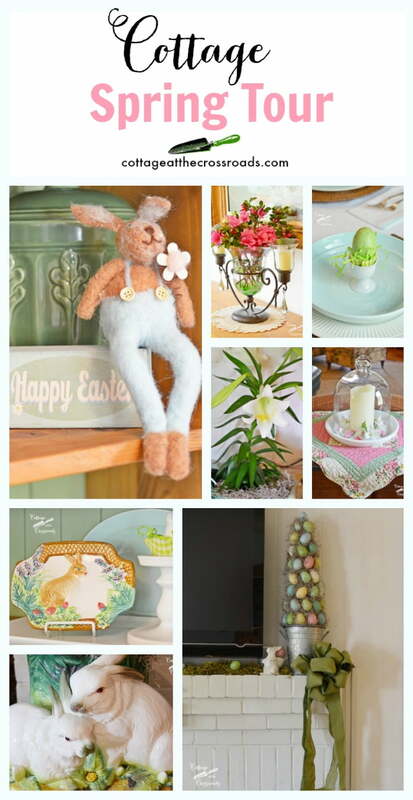 and the beautiful shades of green!….so many adorable bunnies too! HAPPY SPRING!!!! I love your cozy little cottage. It is so homey and welcoming! You sure got a deal on your planters. Who pays $500 for planters? Belated Easter Blessings to you and Leo! I love your beautiful home, inside and out! 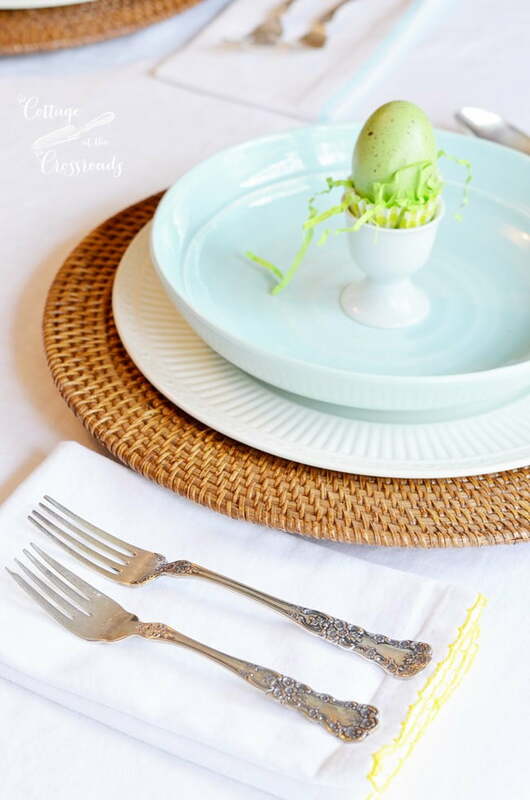 Thank you for showing the dining room all deck out in spring and for Easter. Need some contrast with fireplace screen, I’m thinking. I remember the story about the dough bowl, so pretty with the eggs and flowers. Jane, everything looks so springy and homey. I vote yes on painting the fireplace screen. 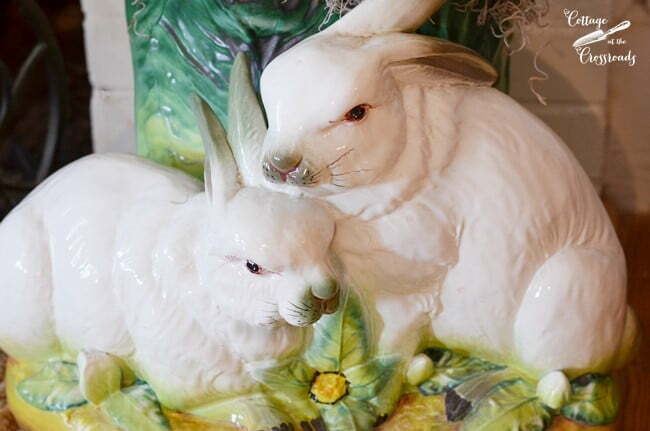 As for the bunny planters, I hope you increased your homeowners insurance once you saw what you had. Wow, what a deal! 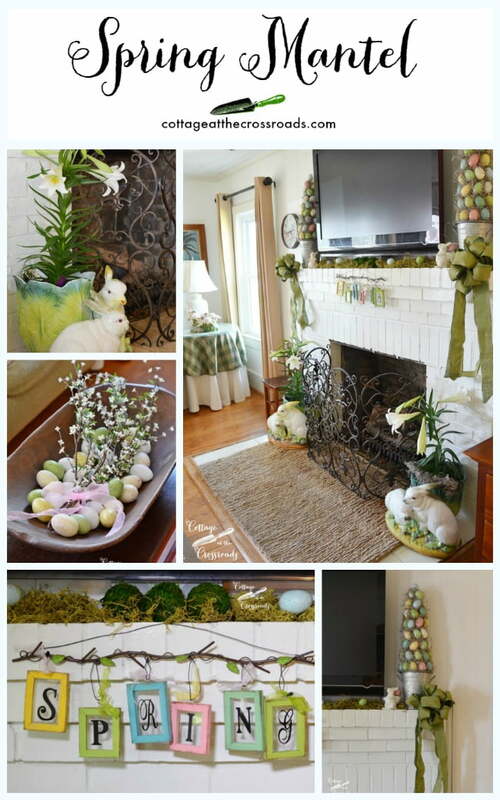 To answer your question,I would not paint the fire screen,I think it will get lost with the white fireplace. I like the contrast of the dark. Jane you have so many cute spring touched going on. Im quite intrigued by the butterfly pencil art. I love the adult coloring books and that’s what it reminds me of, just beautiful. You and Leo have a happy Easter! Just beautiful! Your decorations are amazing and I love your ideas! It all looks so pretty, Jane! 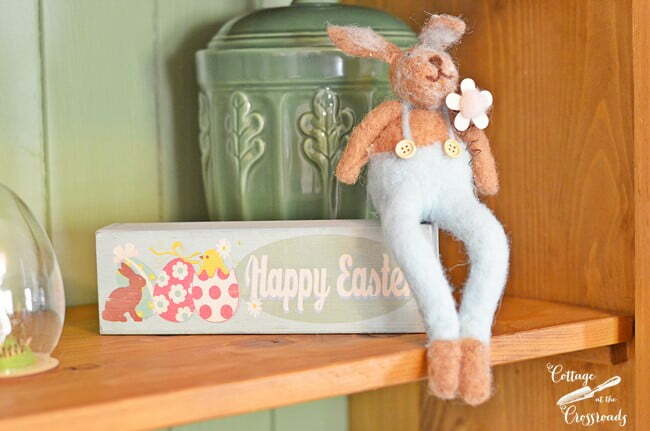 Love the fabric bunnies!! Jane, everything is so beautiful and springy! Love all the Easter bunnies. Can’t wait to come visit soon with our garden club! Thanks for sharing! To answer your question re. the fire screen: no, I wouldn’t paint it white! Maybe spray paint with a slightly bronzed look? I like the more rustic, older look! What a lot of decorating you have done: very very nice and so cheerful! Beautiful and boy did you get a deal on those bunnies!!!! Jane it all looks so pretty. 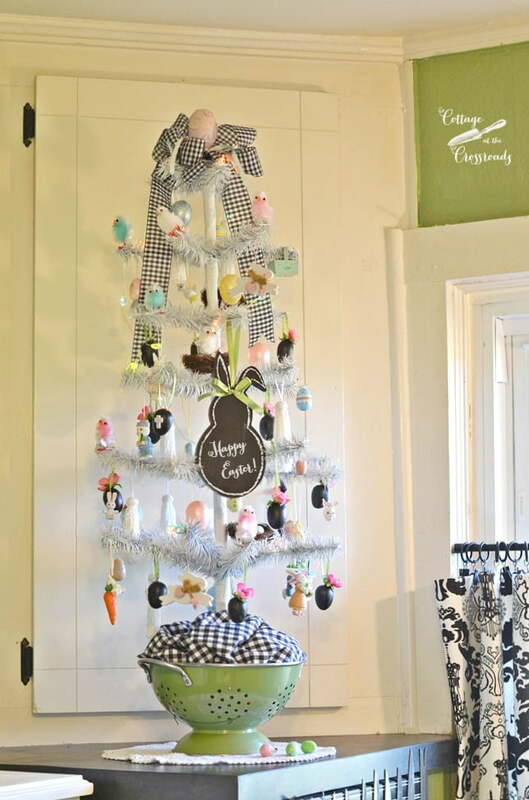 Love your Easter Tree. 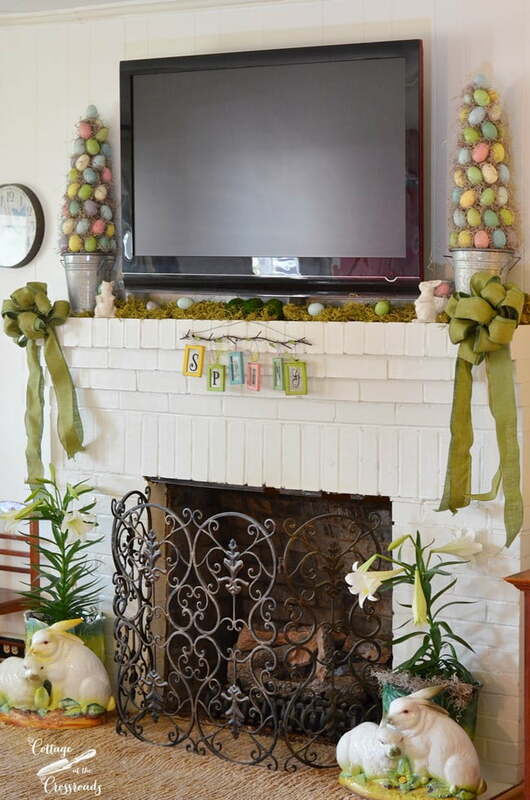 Your creativity with your Easter decor is fabulous. Everything is just lovely! You are a very talented lady…so many beautiful details and everything flows together just right. Happy Easter! So pretty at your place! Love the bunnies. That print is something to truly cherish, and I can tell that you do. Everything is so cute and spring is my favorite season, too. Just wish it lasted longer. You did score on those bunny planters. I love them a lot!!! That embroidered piece in the bowl is lovely too. You managed to pull of a great look with all those pastels.